X-rays should be familiar to anyone who has had to undergo the procedure before, but gamma rays are a bit less familiar. In fact, most people of a certain age and demographic typically associate gamma rays with a well-known comic book character, although this comparison article should show that there is a lot more to it than that. X-ray is a type of electromagnetic radiation, and its wavelength ranges from 0.01 to 10 nanometers, which places its frequencies in the 30 petahertz to 30 exahertz range. This means that X-rays have shorter wavelengths than UV rays and longer wavelengths than gamma rays. X-radiation is also often referred to as Röntgen radiation, after the scientist who discovered them, Wilhelm Conrad Röntgen. The name stems from the fact that X-radiation was a previously unknown form of radiation. 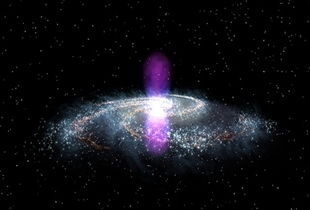 Gamma rays are also comprised of electromagnetic radiation of high frequencies. These rays are produced through the interaction of sub-atomic particles via electron-positron annihilation, fusion, and fission among other processes. Gamma rays generally have frequencies higher than 1019 Hz, and their energies are measured as higher than 100 keV, with wavelengths less than 10 picometers, which makes them smaller than atoms. Gamma rays that result from radioactive decay have energies that are measured at a few hundred keV, and they are generally less than 10 MeV. While there is no lower limit to such energies, the upper limit has been pegged at approximately 20 MeV. 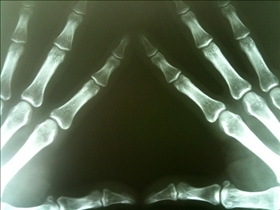 X-rays are commonly used in many aspects of everyday life. They are a common feature in airport security systems for instance, and they are also widely used in industries such as crystallography, astronomy, and fluorescence, in addition to various other industrial applications. Gamma rays on the other hand aren't used nearly as much, mostly because they are very radioactive, and they can cause significant damage to tissue cells. That being said, there are various uses for gamma rays in everyday life, such as for irradiation, nuclear medicine, semi-precious stone, medical equipment sterilization, pasteurization of some food, measuring the thickness of metal, and measuring the density of soil. As mentioned previously, gamma rays are quite a bit more harmful than X-rays, and they can be very dangerous to humans. Gamma rays can also penetrate into numerous materials to a considerable degree, and they can subsequently cause powerful ionizing radiation. In fact, prolonged exposure to gamma rays can result in cancer, which makes the basic premise of a certain comic book a bit less plausible. X-rays are emitted by the sun. Gamma rays are emitted by the sun. Which one is more dangerous? gamma rays is dangerous because the have a higher frequency and shorter wavelength, and the are originated in the nucleus. And also the are radioactive and the cause significant damage to tissue cell. the have generally frequency of higher than 10 19 Hz, and measured as higher than 100 KeV. gamma ray emitted by the sun. appuram en manithargali pathikkala. oson protect pantutha. Gamma rays comprised of electromagnetic radiation of high frequencies. The produced through the interaction of sub-atomic particles via electron-positron annihilation, fusion, and fission among other processes. Gamma rays generally have frequencies higher than 1019 Hz, and their energies are measured as higher than 100 keV, with wavelengths less than 10 picometers, which makes them smaller than atoms. Gamma rays that result from radioactive decay have energies that are measured at a few hundred keV, and they are generally less than 10 MeV. Lets put it like this all the nuclear bombs/technology on this entire planet if they could be reduced to a single sphere the size of your fist. That sphere would be two hundred times the power of everything combined, that is enough destructive force to eradicate our entire solar system and anything neighboring it. The rays themselves are "no different. The difference comes from their source!!!! Once they leave their sources (isotope vs an xray machine) it is one cannot distingish the two "if" they are of the same energy. If one can determine the radiation energy(s) it is possible to determine their source. For example, Cobalt 60 emits gamma ray energies of 1.17 and 1.33 MeV. Thus it is an excellent isotope for treating head/neck cancers and brain cancers. Chicken vs. Egg: Which came first? Tsunami vs. Earthquake: How are they different? Airbus vs. Boeing: Who's bigger?